This post was supposed to go up last night, but my internet went out. So just pretend like it’s still Sunday. That’d be nice, right? I had a running buddy this morning! 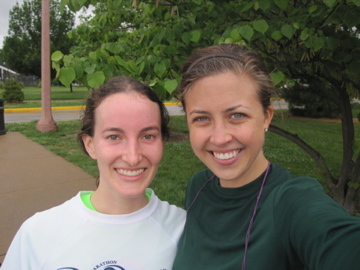 Margaret, a friend from high school, is an insanely talented athlete (I think she played varsity in every single sport our high school offered) and asked if I wanted to run with her. Ummm YES! I haven’t had a friend to run with in months! Despite the rainy weather, we met in Forest Park and set out to complete the 5.5 mile loop. 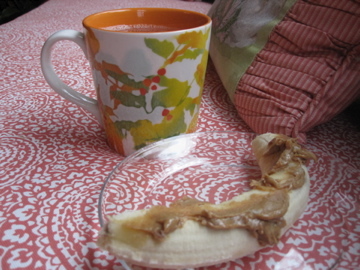 I ate a banana with almond butter and a mug of hot lemon water before I left. We’d never run together before so I didn’t now how our pacing would work, but somewhere around mile 3 we looked at our Garmins and noticed we had run a 7:45 minute mile. WHOOAAA! I knew it felt hard but I thought it was because we were talking and the course is hilly. Neither of us usually run that quickly. That’s the benefit of running with someone else — you push each other! I hope we run together more often because it will be great speed work. Plus Margaret is awesome and I love hanging out with her. After the run I hit the gym for some strength training. I warmed myself back up with an easy 20 minutes on the elliptical and then completed two circuits of arm and leg exercises. 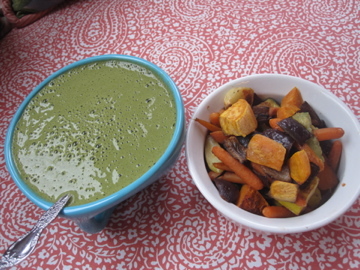 I would have done more but I got hungry –time to head home for a post-work out Green Monster. 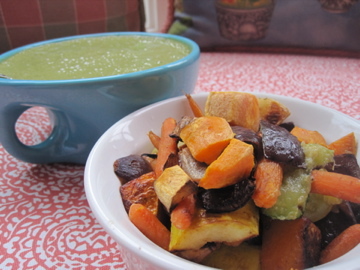 I made my favorite Chocolate Vanilla Green Monster and roasted a package of pre-cut veggies from Trader Joe’s to have on the side. Those pre-packaged vegetable mixes are my favorite. I know they are more expensive, but the variety and convenience is worth it to me! After lunch I spent some time at Barnes n Noble getting blog work done. I snacked on some TJ’s Seaweed Snacks (not completely in love) and an apple while there. 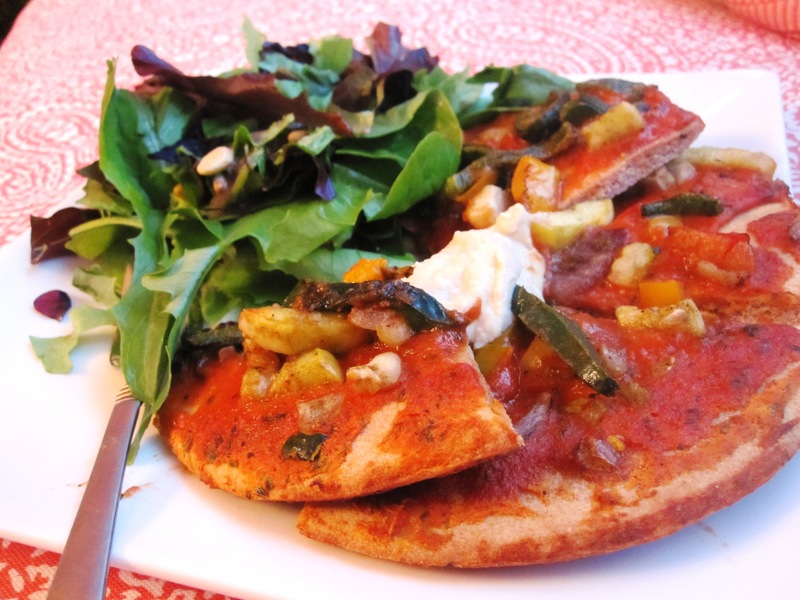 I wasn’t super hungry when it came time for dinner, so I just popped a Whole Food’s 360 Brand Vegan Pizza in the oven, topped it with a blob of hummus, and had it with some salad that my parents ordered from Dewey’s. Dessert was a grapefruit and some wheat thins. ← Mexican Hot Chocolate Granola Giveaway! That sounds like an intense run! I’ve never bought those veggies but they would be so much more conveinent than chopping them all seperately – and maybe they are worth it because you aren’t throwing any away! Those splits are crazy! I don’t think I’ve ever run a mile that fast lol. I’ve actually never run with a friend, since most of my friends aren’t into it. And I also hate talking during runs. I think I’m missing out! wow!! awesome run!!! that pace is killer for that distance!